By half time we had put in our order for humble pie and devoured it with some enthusiasm after a makeshift Kildare side made a nonsense of our pre-match doom-mongering. With promotion in the bag and a likely re-match against today’s opponents on the cards in Croke Park next Sunday, Cian O’Neill sent the most callow Kildare outfit into a competitive fixture in all my days watching the Lilywhites. I genuinely feared for the long term mental state of the back-line in particular. Three of the six backs had been dismantled by Longford under-21’s a few short weeks ago. None of the full back line had started a league game for Kildare previously. Oh and Galway came into the game having scored 8 goals and a deluge of points in their previous 2 games. Surely we were in for an almighty hammering against the Tribesmen, who had a seven-year itch that needed to be vigorously scratched to secure themselves a return to Division One along with their opponents. But youthful Kildare were dogged. The side was interspersed with the experience of Eamon Callaghan, Peter Kelly and Emmet Bolton, but the latter two were gone by the 38th minute. They started strongly, looked set to be over-run during the middle section of the game, but fought back with spirit in the last 20 minutes as reinforcements arrived from the first-teamers on the bench. Galway – tense, neurotic Galway – got the fright of their lives and could scarcely have lived down the ignominy if they failed to take advantage of this “gimme” of a game. Thankfully for them they had one player willing to take the thing by the scruff of the neck and put their young opponents in their place. Twice in the last 20 minutes Shane Walsh may as well have roared “ah for ****’s sake lads let’s just get this done” at his labouring colleagues and raced defiantly through the inexperienced Kildare cover to secure critical points for the struggling Westerners. The second of those seven minutes from the end was their last score and it was just about enough. Kildare were the better team for much of the opening quarter. While Galway put up a defensive shield and played a laborious hand-passing game completely alien to the county, Kildare were the ones making progress with accurate kick-passing into the corners. Ben McCormack, who along with the excellent Fionn Dowling was probably one of only two starters likely to earn a place on the XV next week, was too hot for the Galway defence to handle. After Dowling had opened the scoring inside a minute with the first of four magnificent points from play, McCormack almost found the Galway net after cleverly spinning inside his marker. First Rory Lavelle spread himself to save and a follow up effort from the Sarsfields youngster was cleared off the line. There were hints of a foul in the process but nothing given. McCormack was on fire early on though and he did find the range to push Kildare 0-2 to 0-1 ahead on 8 minutes. Shortly afterwards Kildare keeper Shane McNamara almost had a disastrous aberration when he fumbled a ball but thankfully nothing came of it. The Celbridge man was rarely troubled which is a double-edged sword for a goalkeeper trying to impress. Galway began to run more directly at Kildare and in a half of poor quality they gradually asserted themselves. Thomas Flynn, the veteran Sean Armstrong (no sign of his partner of old Michael Meehan today), and then Gary Sice from a free pushed them 0-4 to 0-2 ahead by the 20th minute. But Kildare were always encouragingly competitive and the home crowd’s grumblings were a regular feature. Dowling scored two more fine efforts from play to sandwich a Barry McHugh free before Walsh and excellent wing back Johnny Heaney sent the home side in ahead by three at half-time. Kildare had lost Kelly to a black card on 23 minutes after a trip on Walsh as the Galway centre-forward bore towards goal on one of those dangerous runs of his. No argument. Although Kildare had faced the wind you felt the momentum was with Galway and they’d relax with a bit of a gap opening. When Sice (free) and Eamonn Brannigan pushed them five ahead and Kildare lost another experienced defender in the returning Emmet Bolton within 3 minutes of the restart you were convinced it was going to be a long second-half. Bolton had a difficult return after an appendix removal at Christmas. His robust tackling didn’t find favour with Derry referee Barry Cassidy as he gave away a number of scoreable frees and picked up a yellow card for his troubles before succumbing to injury. Kildare reduced the gap to three points with fine scores from Callaghan and McCormack before Armstrong and Paul Conroy pushed Galway five clear again. The Lilies though were beginning to enjoy themselves a bit and substitute David Hyland stole forward to kick a long range point much to the pleasure of some “the only way to beat a massed defence” merchants seated near us. Cathal McNally – as frustrating as ever with his profligacy in front of the posts -found the range with the first of two points with 20 minutes remaining and again it was a three point game. Back came Galway again though and Walsh provided the first of his incisions before Brannigan seemed to sew it up with another point. Galway were ahead 0-13 to 0-8 with 17 minutes remaining. They’d only manage one more point though. 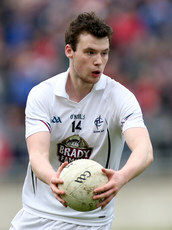 Kildare lost Athy’s hard-working Pascal Connell to a black card after he took out Sice with a third man tackle but with Kevin Feely replacing him and joining Niall Kelly and Paul Cribbin on the field, the Lilywhites had a more familiar look to them. They were also playing with a freedom that Galway lacked as the Westerners seemed to go into their shell with the finish line in sight. Between them Dowling and Kelly shared in a four point spree between the 56th and 62nd minutes and Galway were suddenly wracked with nerves, on the field and in the packed stand. Walsh’s second intervention eased the palpitations somewhat as he thundered through once more to push them two ahead with seven remaining. Kildare came again but were profligate in the final five minutes. Cribbin kicked poorly into the keepers hands and then wide with a second effort, Feely missed the sort of free from the right that he’s been kicking in his sleep of late. McNally did however put the game right in the melting pot with a superb score right on 70 minutes to make it a one-point game. Kildare’s last chance fell to ‘keeper McNamara but he never got hold of a hail-Mary free from all of 55 metres and Galway held on for a one point win and a return to the promised land. The pitch invasion that ensued may have been driven as much by relief as jubilation as this was never comfortable for the Tribesmen. For Cian O’Neill this was something of a triumph, if ever a one point defeat can be regarded as such. He was rewarded for the faith he has in his panel with a performance of real determination. The defence creaked at times but the likes of Darren Maguire, Liam Healy and Shea Ryan in particular showed some promise and will gain a lot from the experience of facing the likes of Walsh, Brannigan, Flynn and Armstrong. As a guide to next week the relative performance of both sides may be mis-leading. It won’t necessarily follow that a full-strength Kildare will turn the tables on today’s opponents. They hopefully will not be over-confident going in to that one. A glance at the history books should be enough. Kildare have still not beaten Galway since 1985. Galway will presumably play with the shackles off next week and when they put the head down and ran at Kildare they looked dangerous. They didn’t do it enough but if they do they can still make hay against a rearguard that hasn’t yet convinced their supporters that the problems of recent years are completely behind them. Kildare: Shane McNamara; Darren Maguire, Mark Hyland, Liam Healy; Peter Kelly, Shea Ryan, Emmet Bolton; Fionn Dowling (0-5, 1f), Pascal Connell; Eddie Heavey, Conor Hartley, Con Kavanagh; Cathal McNally (0-2), Eamon Callaghan (0-1), Ben McCormack (0-2). Subs: David Hyland (0-1, for Kelly B/C 24), Keith Cribbin (for Bolton 38), Niall Kelly (0-2, for McCormack 48), Paul Cribbin (for Heavey 51), Kevin Feely (for Connell B/C 55), David Slattery (for Hartley 62).